Soon Google Chrome is going to use even more of your RAM, assuming that it’s even possible to use more than it already does. This is because of Chrome 67’s new Site Isolation feature to protect against Spectre. This also means that all iframes on a page (generally for ads) are put into a separate process than the parent frame, further increasing memory usage, but increasing security at the same time. They deployed a similar technology a year ago to move extensions to out-of-process iframes to protect malicious web pages from being able to use extensions to gain extra privileges. The bottom line, for people that open a ton of tabs, this is going to dramatically increase memory usage. You might need to consider using a tab manager extension. Assuming you have a ton of tabs open already, you can open up Google Chrome’s Task Manager (Under Menu -> More Tools) and look for processes that say “Subframe:” and show a URL that is clearly not something you’re browsing directly—for instance doubleclick.net or 2mdn.net, which are iframes for ads. 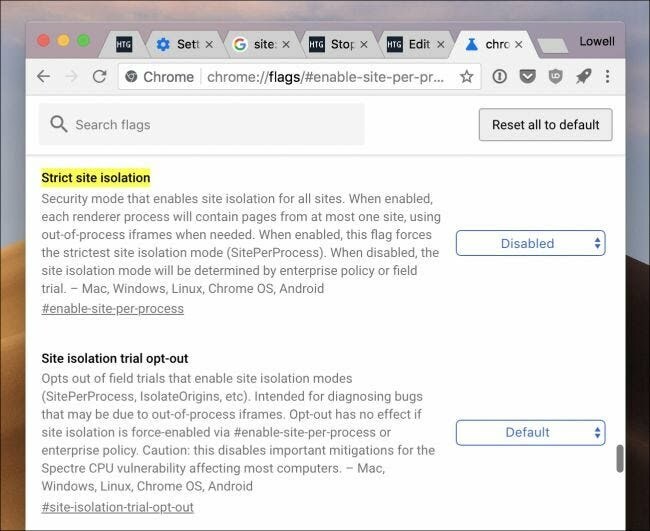 To check whether this is enabled, or disable it should you choose (which we don’t recommend), you can head to chrome://flags#enable-site-per-process in your location bar, and then set the toggle for Strict Site Isolation to either Enabled or Disabled. You could also add a command line flag to start Chrome with –site-per-process, but that’s a lot of work. You’d think the first option would control it, but even if site isolation is set to Disabled, the option below for “Site isolation trial opt-out” actually controls whether you’ve been opted into it. As of right now, Google has enabled Site isolation for almost everybody, so you’ll need to set the “trial opt-out” setting to “Opt-out” in order to turn this off. Which, again, you should not mess with. It’s worth noting that even if you disable it, at some point Google will probably make this the default behavior and remove the ability to disable it, because site isolation is a lot more secure.